With ridiculous, record-setting heat roasting Japan this summer, everyone is feeling themselves drawn to cooling food and drink. Luckily, this is Japan, where frosty beers flow free and shaved ice is stocked in supermarkets. But if you’re looking for a way to cool yourself down while also filling yourself up, you might want to consider this Tokyo ramen that’s served in a container chilled to -79 degrees Celsius. However, you won’t find the Hiyashi Paro, as the dish is called, at any of Tokyo’s many back-alley ramen restaurants. Instead, it’s being offered by Pasela, operator of a chain of stylish karaoke parlors. Pasela offers an extensive menu of food ad drink items as well, and after you order the Hiyashi Paro, it’s brought to your room in a traditional ramen delivery case kept cold with dry ice, and once the cover is opened, an icy blue light shines forth, and there’s even a special piece of background music that plays as a dramatic fanfare to your meal’s arrival. While cold ramen (usually called hiyashi chuka) isn’t so unusual, the dish is usually only as chilled as a salad would be, not to the extreme cold that the Hiyashi Paro comes carried in. Also, while ordinary hiyashi chuka is usually lighter than standard ramen (again, somewhat like a pasta salad), the Hiyashi Paro is a hearty heavyweight that comes with thick-cut chashu pork strips, deep-fried red peppers, and a mountain of shredded carrots, cucumber, and other veggies, with the whole thing seasoned with sansho pepper and mayonnaise. If the name “Paro” sounds sort of familiar to ramen fans, it’s because Pasela’s Paro Ramen was inspired by legendary Tokyo ramen restaurant Ramen Jiro. If you’re worried that a karaoke company might not be all that committed to creating food that actually tastes good, put your mind at ease. Pasela is as famous for its tasty eats as its singable tunes, having earned fame not only for its signature honey toast dessert, but also as the company behind Akihabara’s "Final Fantasy"-themed restaurant, which serves up an amazingly tasty ramen of its own. 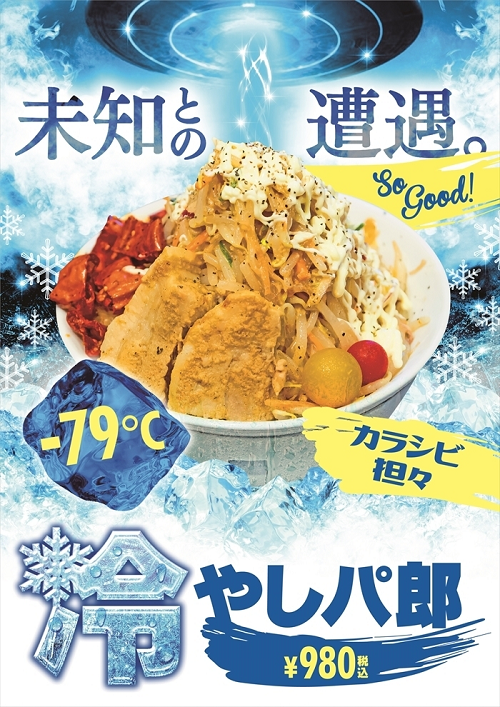 Speaking of Akihabara, the Hiyashi Paro is exclusive to Pasela’s Akihabara Showadori branch, where it’s being offered until September 15 for a price of 980 yen (US$8.80).